For the last few days I’ve been sleep-deprived, surrounded by flu sufferers and deep into macroeconomic issues. Food at home was last Saturday’s chicken, hot dogs, toasted bagels with what ever you could find in the fridge, and vanilla meringues from Trader Joe’s for the kids when I wasn’t watching. 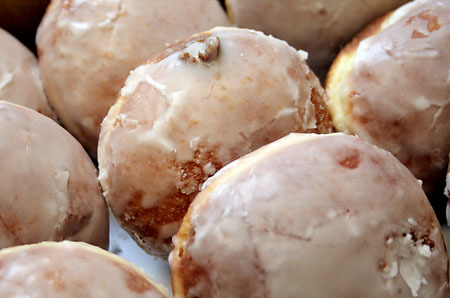 The only culinary highlight of the week were pączki – Polish-style donuts for Fat Thursday, which was yesterday. I have no idea why Poles celebrate Fat Thursday and not Tuesday like much of the rest of the world, but there’s no use questioning it. Anyway, the tradition is to eat as many as you can handle before Lent. We observe this tradition diligently, though none of us has any idea when Lent actually starts. I must be in a really bad shape, as I actually ate two and didn’t squint – I don’t have much of a sweet tooth and donuts are not my type of sugar fix in any case. But these were good, stuffed with plum or rose jam and not too greasy – fresh and yummy. Never in my worst nightmares would I dream of making them myself – too complicated for something that the next door Polish bakery makes much better. For those in Chicago and willing to forget their sugar and fat intake limits for a while, the address is Delightful Pastries, 5927 W. Lawrence – near Austin Ave.